Synopsis: Sam Harper (Pine) is in debt after a major mistake he makes at work, and when his estranged father dies back in L.A., he reluctantly returns home. It’s there that his father’s lawyer gives him $150,000 – but tells him to give it to a woman named Frankie Davis (Banks) and her son. Sam soon discovers Frankie is his half-sister that he never knew about and has to make a choice: does he give her the money or use it to get himself out of debt? Andrew: Hello readers! 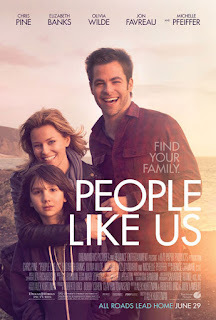 Last night Sarah and I made the dangerous journey to the movie theatre on a Friday night, made it through the throngs of women who were there to see Magic Mike, and we slipped into a smaller theatre to see this weekend’s new Chris Pine/Elizabeth Banks drama People Like Us. Sarah, we talked about this in our weekly preview on Thursday and were both looking forward to it. I didn’t know a whole lot about the movie up until a week ago, but you had. So what are your thoughts after a night of sleeping on it? Sarah: Well I had seen trailers for it for a while now and I would have to say that I enjoyed it. It was very heartwarming, which is what I expected. It tugged on the heartstrings, and although it was a semi-predictable premise once you got into the movie, it was still good! I enjoyed it! What did you think? A: I really enjoyed it! Yes it’s a bit predictable at times, which I don’t think is a bad thing because it’s a relatively simple premise, but I look at it kind of like Seeking a Friend for the End of the World, where you can kind of see what’s going to happen coming, but it’s HOW they get there and how the actors do. And I think the strength of People Like Us, bar none, are the two leads, Chris Pine (Star Trek) and Elizabeth Banks (What to Expect When You’re Expecting). S: And they had such great on-screen chemistry! And that’s point I want to make: this was a powerhouse cast. Everybody gave such amazing performances, even Olivia Wilde (Cowboys & Aliens), who is a minor character in the grand scheme of things. For being a pretty A-list actress, she took her role for what it was and did a great job. Michelle Pfeiffer is killing it these days now that she’s playing older roles, great roles that really fit her well. A: He reminded me of Jonah Bobo as Robbie in Crazy, Stupid, Love. S: Yes, a lot like him. A: The acting was phenomenal really, and the casting choices were even better I think. Pfeiffer, I totally bought her as being able to be Chris Pine’s mother. I think the eyes had a lot to do with it, all three of the leads have very blue eyes. But just the subtleties they play…like Pine’s Sam is really kind of a selfish jerk for half the movie. There are a lot of things about him early on that make him an unlikable character, but Pine is just so earnest and inherently likable that you can’t help but like Sam despite the mistakes he makes. You just go, “C’mon, man, just do the right thing!” You really just want him to succeed, make the right choice and tell Frankie the truth. S: But at the same time the characters were so well developed… I didn’t really think Sam was such a jerk. I kind of knew the premise and you have to imagine things…neither one of these kids grew up with a father. The guy probably did the best that he knew how but just wasn’t cut out for the whole fatherhood thing. And so both of his kids suffered for it in very different ways, yet ended up pretty similar. They had great chemistry as a brother/sister couple and you could tell that they could grow to love each other as a family. Then you have Pfeiffer’s character, who really had to live with the knowledge that her husband was unfaithful and had another family. You have to imagine the toll that would take on people. So it was just very interesting and impressive for an ensemble cast like this to pull it off. A: Can I just point out real quick that Chris Pine is quickly becoming one of my favorite actors in Hollywood? He just has that charisma you look for in a leading man and there are very few new ones nowadays. He’s perfect as Captain Kirk in the new Star Trek films, I liked him in This Means War, and I liked him in this. S: Yeah, they accept him pretty quickly, don’t they? A: That’s the one thing I think some people might go, “That’s unrealistic.” I didn’t have a problem with it. I can see how some people might, but I think it goes to the strength of the writing and the actors that you bought that these two individuals needed each other and that there’s a sort of destiny that they needed to do this. They just made a cute, believable family unit. It’s a bit of a tearjerker, it got to me a little bit because it hit a little close to home. S: It was about halfway through the movie where I figured it might hit close to home with you. A: And I knew it would. S: I wasn’t prepared for that. A: Well when I first saw the trailer and saw what the real premise is, I knew it would. So it hit a little close to me, but even if it weren’t for that, I still think this is a very good movie. If anything, see it because of Pine, Banks and Pfeiffer. They all knocked it out of the park. S: It truly is a great cast. A: And it’s a good directorial debut by Alex Kurtzman. I was looking forward to how he would do with this. I liked the way he used Los Angeles, he didn’t use it in a flashy “Hollywood” sort of way, he used it in more of a warm, West Coast way. S: It felt a lot more like a small-town feel to me, which is different for a L.A. movie. Like, you didn’t feel like you were in this ginormous city. It felt intimate in a city that has millions of people in it. A: And that’s a totally different take and I enjoyed that. I definitely look forward to more directing jobs by Kurtzman. So what’s our final grade? S: I don’t think you need to see it in theatres. It would make a nice matinee, but you can wait to Netflix it. That said, this might be one that ends up on our shelf! I also really liked this movie when I saw it last year. You're right, the strength of it was the casting. I loved Chris Pine and I also think he is one of the most unappreciated actors in Hollywood. I know many people found this too sentimental but I thought it was a beautiful film. We agree, Chris Pine is one of the best new breed of Hollywood leading men. Thank you for your comment!